The second day of action at the Pannergy FIBA Europe U18 European Championship marked the end of promotion ambitions for two teams, England and Switzerland. On the brighter note eight teams booked their places for the qualifying round (2nd round). Michael Ball, the coach from England, was left wondering what could have been after seeing his team fall to Bulgaria (62-69). He had high hopes this year after last year's 8th place finish and more or less repeated the preparation this year with training camps in Hungary. However a defeat against Group A rivals Germany in the first game meant that his team needed to win another game to stand a chance of staying in the competition. Going into the interval leading (31-30) and with Iva Kostova in foul problems things were looking good. 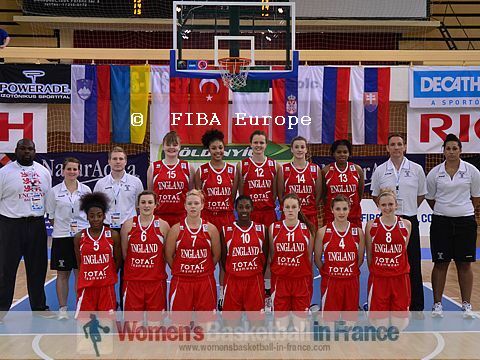 However Bulgaria regained the lead midway through the third quarter and stayed in front for the rest of the game. Kostova managed her foul problems and scored 28 points to see Bulgaria through. However England's elimination was only confirmed later in the evening with Belarus beating Germany in a nail biting finish (53-50). The elimination of Switzerland from the promotion race so early does not come as a shock because they are still developing their youth international programmes for women's basketball. At the same time Group B has three teams with rich youth programmes. Switzerland were not able to recover from their heavy loss against the hosts on day 1 and fell (49-71) to Portugal. Joana Jesus did most of the damage with 22 points. In the other group game Croatia beat Hungary (60-49). This implies that the six teams from Group A and B make up Group E for the qualifying round are: Belarus, Bulgaria, Croatia, Germany, Hungary and Portugal. Finland won the Nordic derby against Denmark (82-61) with 24 points coming from Evita Iiskola. Once Finland took the lead after three minutes they put themselves in control for good with a 16-0 run in the first quarter (20-5). Denmark never threatened again despite reducing the deficit to 7 points early in the second quarter. Israel were given a rough ride by Luxembourg (84-71). During the first quarter the concept of defense did not exist with Israel coming out on top (33-23). However neither side was able to keep up the pace for the rest of the game. Lenna Hetto was the leading scorer for Luxembourg with 27 points while Hadar Levi and Chen Weisbort shared the scoring with 14 points apiece for Israel. Israel and Finland are through to the next round while Denmark and Luxembourg face each other in a winner-take-all match to determine which is the third team to go through. Latvia needed a win after losing in overtime to Greece on day 1 to get their competition started. Latvia had Asnate Fomina (left) showing some of the skill displayed during the FIBA Europe U20 European Championship for Women Division A earlier in the summer. Her side was never in trouble once they took the lead for good eight minutes into the game. Renate Reine led the way with 13 points while Fomina had 10 points. For Norway Stine Austgulen also had 13 points. Greece played good basketball for just 20 minutes against Austria. They dominated the first quarter and opened (13-2) to finish with a (20-8) lead. The second and third quarter was just a festival in the art of missing by both teams. Although it could be argued that they played good defense. Artemis Spanou did most of the scoring for Greece during the two quarters giving her team a (38-26) lead going into the final quarter. Greece stepped up in the last quarter and pressed Austria out of the game with an 18-0 run to win (59-31). Spanou finished with 16 points and did not play in the final quarter. Anthoula Chatzigiakoumi was the only other player in double digits with 12 points. Greece are the only team in Group D so far to qualify for the next phase.